How is this the end of April? My April was a relatively messy month. It was stressful, unorganized, and in terms of my blog life, less than productive. But, as it likes to be, life is unpredictable. What's not though, is Pearlesque Box (see that perfect segue?) I mean, what's a better way to start the month than with a few new skincare goodies? 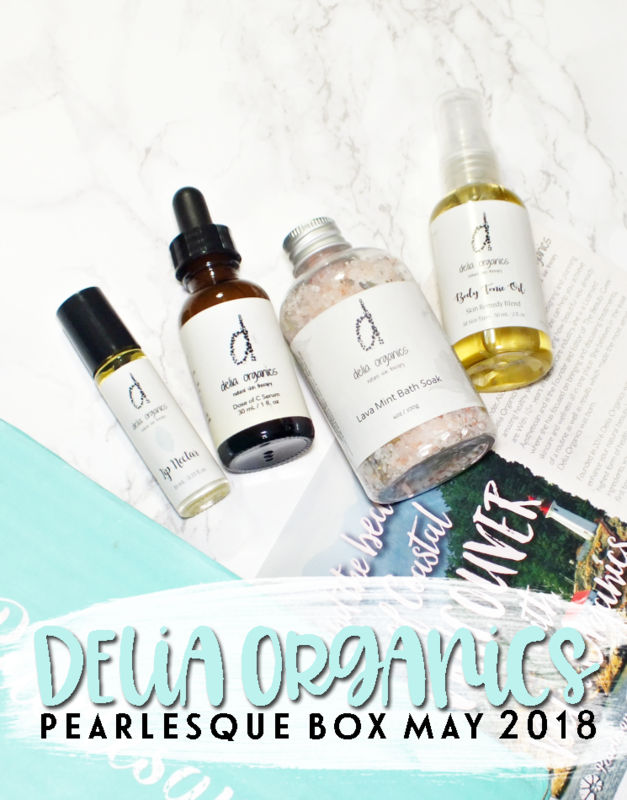 The May box features a second round of Delia Organics (who made their debut appearance last April) and includes four great products. 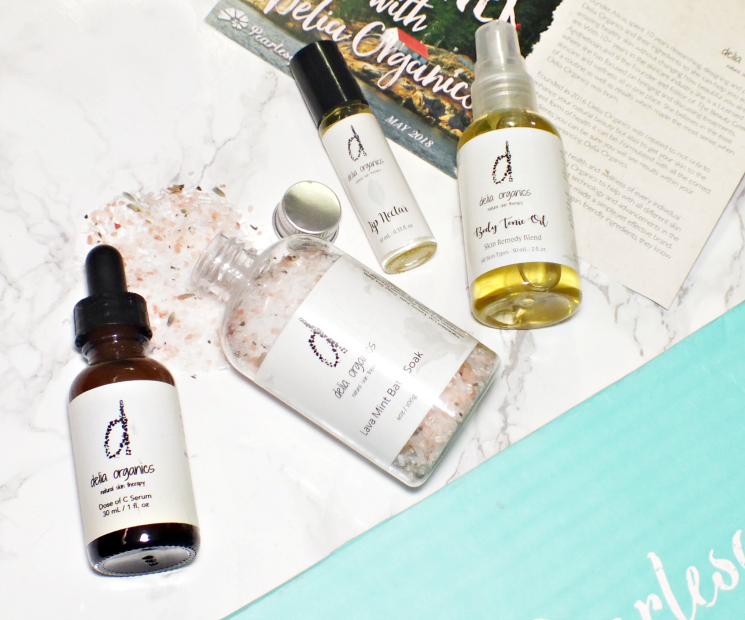 I'm pretty familiar with the Delia Organics product line-up, but was pleasantly surprised to find some new-to me products in this month's box. 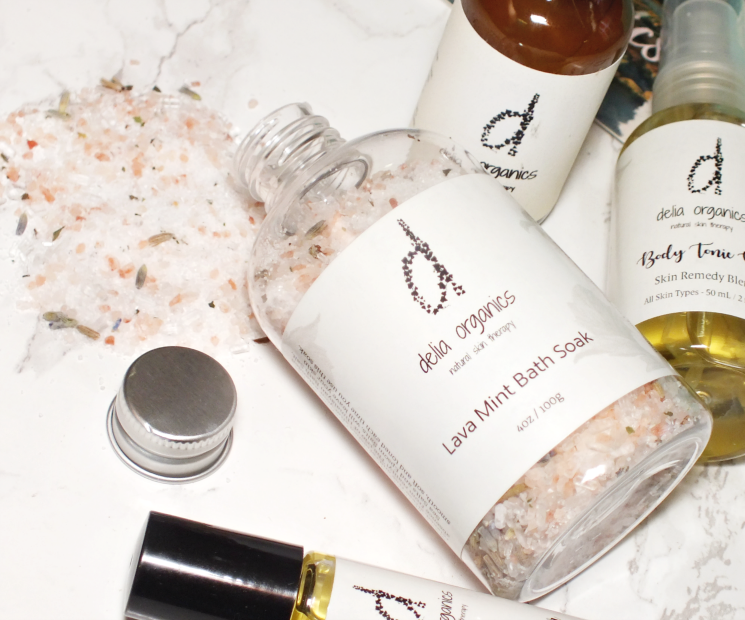 Like the Delia Organics Lava Mint Bath Soak which promises a stress-busting, relaxed-state inducing soak. With a blend of epsom, dead sea, and Himalayan pink salts, peppermint and lavender essential oils and dried lavender for added oomph. 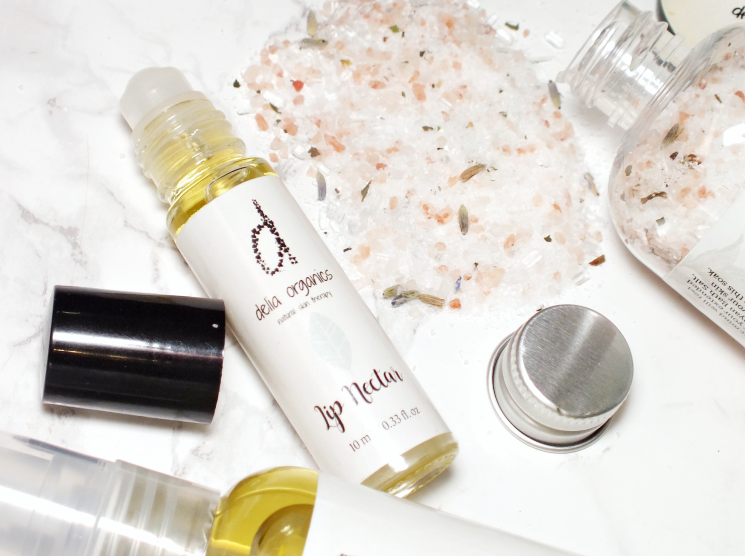 The salt is perfect for a me-time bath, but can also be used for an at-home pedi session. The never-ending winter had had my skin feeling extra dry (allll of it) so body oils have been my bffs. 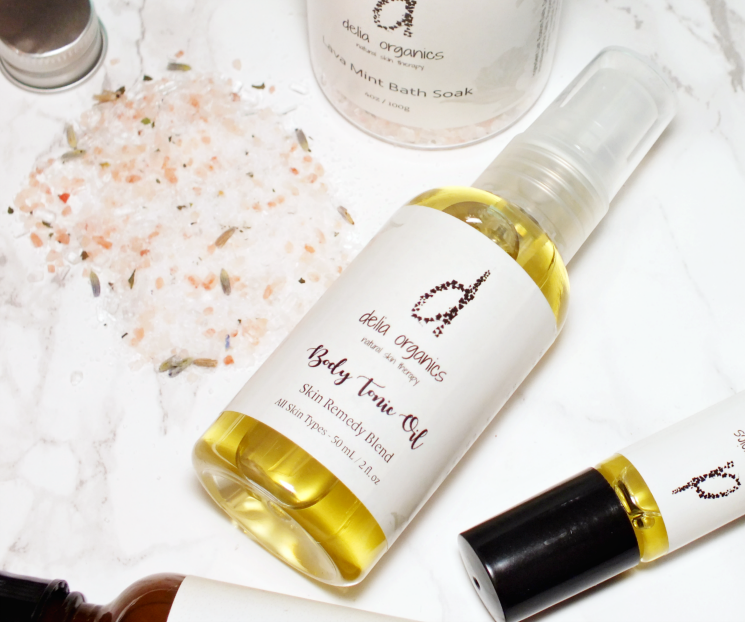 The Delia Organics Body Tonic Oil is a perfect option as the formula works to hydrates, heal dry skin, and promote radiance with a delightful feel- it absorbs really quickly! Featuring evening primrose, olive, coconut, calendula, almond, and sunflower oils along with a blend of essential oils (think lavender, chamomile, geranium, lemon, and sweet orange) this oil has a citrus-herbal scent that is light, but does linger on skin. Lip care can be serious business when it comes to major dryness, but the Delia Organics Lip Nectar is a healing, hydrating, and anti-aging wonder. Featuring a combination of pumpkin seed and grapeseed oils with lemon, sweet orange and lavender essential oils, the formula works to leave lips softer and protected from future damage and the aging effects of free radicals. 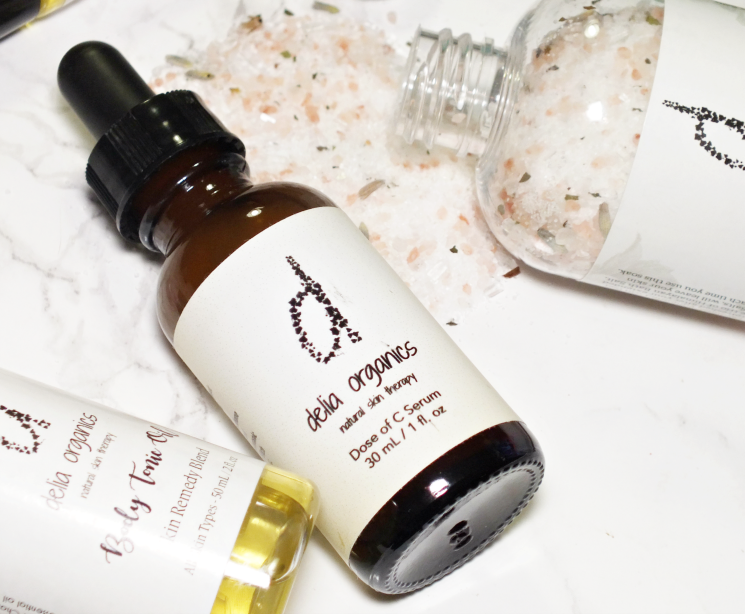 As a serum and facial oil lover, the Delia Organics Dose of C Serum ticks all of my boxes. I've used this serum in the past and love that it is formulated with hylauronic acid to aid in moisture retention, as well working to brighten skin and reduce discolouration, add radiance, and reduce the look of lines and wrinkles while also providing anti-inflammatory properties. The serum has a light-weight feel, is suitable for all skin types and as an added bonus, makes for a great primer pre-makeup. Overall, some great new products from a brand I already love! I have been a massive fan of the eye gel Delia included in the last Pearlesque Box, and I've run out, so I won't lie I was hoping it may make another appearance. I love that Pearlesque Box aids in discovering something you may have otherwise never found. A monthly subscription to Pearlesque Box will set you back $39.95 (free shipping within the USA, international shipping is an additional fee.) You're pretty much guaranteed to get much more for your money- this month's box has a value of $94 USD. To receive this month's box, subscribe here by May 5th and use code BAILEY15 to save 15% on your first order.